If you're looking for some exciting Cocker Spaniel names to help inspire you to name your new Cocker puppy, you've certainly come to the right place! Simply scroll down the page to get started. Choose Your Cocker Spaniel's Name Wisely! So, you've brought your new puppy home but don't have a name for him (or her) yet? Well, that's where I can help you! Below you'll find a great selection of Cocker Spaniel names to get your creative juices flowing. When you're choosing your puppy's name, believe it or not, there's a lot to think about. The name you and your family choose will stay with him all his life so if you get it wrong or later decide that it's not quite right for him, it will be more difficult (although not impossible) to change it. You do want to get it right first time, don't you? Of course you do! Before you begin looking at the puppy names below, I'd like to offer you a few snippets of advice to help you choose something that really suits your little boy or girl. Right, I'll waste no further time and get straight down to business. Here are your wonderful puppy names. When choosing your Cocker Spaniel's name, you could try matching it with your puppy's personality. You don't need to name your puppy before you bring him home; you can do that a week or two later, after you've had a chance to watch his little personality shine through. There's no denying it, Cocker Spaniels are cute, but don't be tempted to choose a cute puppy name simply because he is cute. Your puppy's name will stay with him all throughout his life so ask yourself if the name you finally choose will be just as suitable for him when he's grown into an adult Cocker. If the answer's yes, go for it! 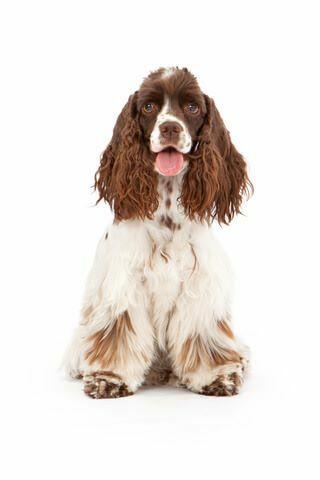 Cocker Spaniels have beautiful coats and markings, so why not use this as your inspiration for choosing your selection of Cocker Spaniel names to pick from? Just a few ideas; if your puppy has a golden or red coat, what about calling him (or her) Ginger, Sandy, or Red? Choosing a shorter puppy name will make it much easier for your Cocker Spaniel to learn and recognize it, and when he hears it he'll respond to it more quickly, making training much easier for you both. Imagine having to sound several syllables each time you call him or give him an obedience command - try it now, and you'll see what I mean - a shorter name with two syllables is much better. Our Cocker Spaniel's facial expressions can sometimes look incredibly nonchalant, so I thought you might like to choose from our trendy selection of cool dog names. I particularly like Solomon, but what about Astral, Harmony, or Ozzy - they're all cool too? It may sound a bit corny, but I also like the name Jarvis.....yes, it's a play on Jarvis Cocker, but I think that's a really cool name for a Cocker Spaniel! Well, that's it for now, I hope I've helped to get your creative juices flowing and you're ready to check out the puppy names below. Want More Cute Puppy Names? Find Even More Puppy Dog Names! If you need more, you'll find a great selection of unique puppy names to suit all doggie 'personalities'. Simply click on any photo above, et voila!